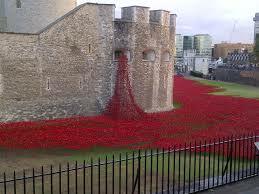 I went to the Tower of London to see the poppies. It’s moving in photographs but in real life it practically winds you it’s so powerful. If you are anywhere near London this year – go. It was one of those days when London’s transport system was all messed up – I tried and failed to reconoitre with Jessica Adams twice – and it seemed impossible to get anywhere. So I got the boat from Tower Bridge to Embankment. Riding along the Thames, looking over at the Globe Theatre, Golden Hind, Tate Modern and all that, never fails to thrill me. While I was standing in line waiting to board the boat at Tower Bridge pier, I watched two young swans on the sand beech preening out their cygnet down. They are probably descendents of the swans which would have lived in just that spot when Henry VIII, Elizbeth 1 – and less fortunate passengers, such as Ann Boleyn – would have arrived at that very spot on the river. you can buy one of the poppies, after Remembrance Day, proceeds to a Charity benefiting service personnel in need…;..
a very worth cause, as I can’t be there in person, owning a poppy will make me feel a part of a wonderful experience…. The whole thing is just beautiful. And they’re all made by hand.